Big Finish: Doctor Who - MAKER OF DEMONS Review | Warped Factor - Words in the Key of Geek. Doctor Who has, over the space of more than fifty years in TV, audio, print and comic-book, proved itself to be infinitely adaptable. Any story there is can be told as a Doctor Who story. The Tempest has, over considerably longer, proved itself to be Shakespeare’s maddest, most uncategorisable play. Uncategorisable, that is, as a tragedy, a comedy or a history. Certainly it’s not a history, except a history of a man and his mistakes. It’s not a comedy as such, although there’s funny stuff in it. And while it could well have become a tragedy, Shakespeare mellows it out at the end, the old man at its core, Prospero, realising his flaws and his follies and putting as much right as he can, asking the audience for forgiveness for an old man’s folly and pretty much promising the same to all mankind in return for their kindness. Really, The Tempest is uncategorisable as a tragedy, a comedy or a history because what it really is is Shakespeare pretty much inventing the non-religious fantasy play. Tell you something about The Tempest though: it makes a cracking Doctor Who story! The Seventh Doctor, Mel and Ace here get a chance to revisit a planet on which at least two of them made an impact before. The fleet flagship The Duke of Milan was lost when the Doctor and Mel turned up, steered its crew to a planet with a safe supply of unlimited energy, and when that planet turned out to already have an indigenous life-form, the Mogera (short, cute, pretty much Moley from The Wind In The Willows), the Tardis team brokered not only peace but an agreement for the Mogera to mine the energy source (the rather unfortunately – if logically – named Doctorium) in everyone’s interest. Bish, bash, bosh, nobody dies, speeches of congratulation and endless gratitude all round, back to the Tardis in time for tea. When the re-united Tardis team go back to the world of Prosper – yes, really – all should be whizzing air cars, glittering spires, and all the groovy special effects of fifties sci-fi. All is not whizzing air cars, glittering spires and all the groovy special effects of fifties sci-fi. All is a human population on the very teetering edge of viability, and armour-clad ogres rising up from the bowels of the planet to slaughter them. Something has gone really rather badly wrong. Finding out what that is splits the Doctor and Mel up from Ace, who’s left to wander in the wilderness and is attacked by one of the said armour-plated ogres. Misunderstanding are aplenty, with most everyone blaming the Doctor for their woes, as he swanned off into time and space and left them to their own Doctorium-powered devices. The Doctor and Mel are welcomed aboard the remains of The Duke of Milan, and investigations begin into the real reason things have gone so catastrophically pair-shaped on Prosper. There are characters throughout the story with name-checks from The Tempest – there’s an Alonso, a Miranda, a Caliban, you get the get the idea (though fun fact, Who-fans – if you ever wondered where the Sycorax got their name from, you could do worse than reading The Tempest). There’s also, throughout Maker Of Demons, an Elizabethan formality of speech, which will either get right on your 21st century wick, or will work for you as a framing device for what the story is – essentially The Tempest In Space. 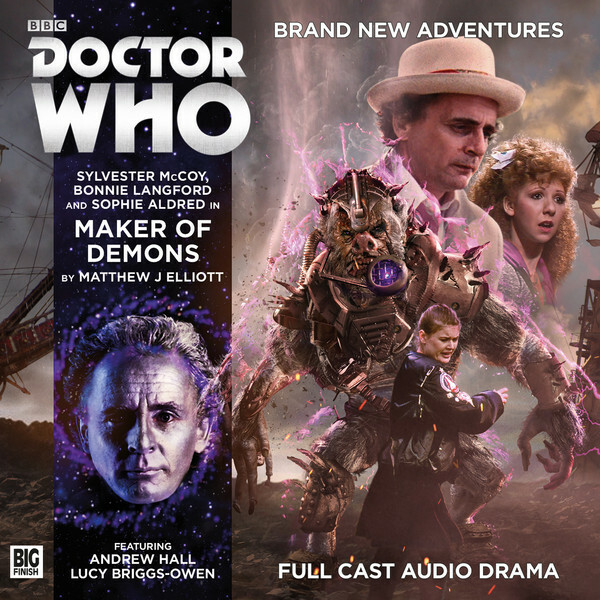 Here’s a thing though – structurally, Maker of Demons isn’t a traditional Seventh Doctor story. Structurally speaking, writer Matthew J Elliott has written a First Doctor story. Separation of the companions, one on either side of the conflict, teaching that both sides have valid points, much trekking across episode-eating scenery for one companion on a quest to find a Big Shot of one of the protagonists (in this case, Ace schlepping around Prosper for much of an episode with an armoured ogre named Talpa in search of their general, Caliban), while the Doctor, safe in the relative warm and cosiness of the human settlement, does experiments to find the source of the problem, and his other companion gets to know the human crew, (here Mel, sticking her nose into the business of the Minister of Fate, Alonso, grumpy lead scientist Juno, and general factotum Miranda (played by increasingly regular member of the Big Finish Repertory Company, Lucy Briggs-Owen)). There’s propaganda from General Caliban, and a neat touch of contemporary comment with conspiracy broadcasting from what could be termed a ‘non-mainstream media source.’ There’s technological fraud and murder, and at the heart of it all, there’s an almost Scooby-Doo reveal that would have been entirely comfortable in the Hartnell era (and indeed was used at least once – but we won’t spoil it for you by telling you in which story). Does Maker of Demons keep you interested and entertained all the way through? Pretty much – the formality of speech, for our money, helps engage the listener by virtue of being out of the ordinary. Again, it’s a formality that reinforces the Hartnellian feel of the whole piece, harking back to an era of annunciation and BBC vowels that saw John Ringham play Tlotoxl of the Aztecs and Mark Eden play Marco Polo. Will you guess the ending ahead of time? Probably – there’s perhaps a little too much pushing you in one direction to keep your mind entirely open. Does it deliver a rip-roaring adventure? Well, yes and no – there’s lots of declaiming (partially a product of the formal speech, partially a product of the human colonists of Prosper being mostly confined to one area), and there is a lot of schlepping from place to place with Ace and Talpa, but there’s more to the schlepping than filler, and in fact, vital chunks of story are revealed en route, allowing for a satisfying equality and balance to the growth of our understanding. What’s more, again in a Hartnellian vein, while it may not be pulse-pounding stuff, there’s a satisfying, constant pulse of increased tension, leading to stand-offs, cleverness, defeat and unfortunate but really quite neat destruction, from a storytelling point of view. If there’s a fault in Maker of Demons, it’s that it really wants you to go and read The Tempest, and so occasionally hammers its points and its pulling of material elements from the play a little hard into your frontal cortex – there’s a point at which you can have too much of a good thing, and if we never entirely reach it here, we flirt with it across the battle lines before it’s defused by the Doctor actively pondering on the origins of the play (a cunning writer’s ruse, of course, but an effective one). But there is a solid lesson for the Seventh Doctor here about the consequences of his actions, and, interestingly, there’s a somewhat childish, ‘I don’t want to go’ reaction from the master manipulator, desperately searching for the approval of the straight-as-a-die Mel to do something utterly unethical to undo his guilt. The ending too is a high point, delivering a suckerpunch of cynicism on the part of the baddies that still, in the world of Trump and Farage, manages to blow your hair back with its homicidal ghastliness. Matthew J Elliott has delivered a rich, faux-Elizabethan, entirely Hartnellian space opera that makes its standard four episodes feel like a properly full, satisfying six, while taking the Seventh Doctor, Ace and Mel into new territory – a return engagement to a previous adventure, and the shocking ways in which good intentions can go horribly wrong. Bit of a belter, this one, and probably (however perverse this might sound), by virtue of its Shakespearean source material and the formality of its language, the most accessible of the three stories in this McCoy bundle. More Elliott, please, Big Finishers.